Global and Local Banks support international trade through a wide range of products that help their customers manage their international payments and associated risks, and provide needed working capital. The term “trade finance” is generally reserved for bank products that are specifically linked to underlying international trade transactions (exports or imports). As such, a working capital loan not specifically tied to trade is generally not included in this definition. Trade finance products typically carry short-term maturities, although they trade in capital. One of the most common and standardized forms of bank-intermediated trade finance is a letter of credit (L/C). 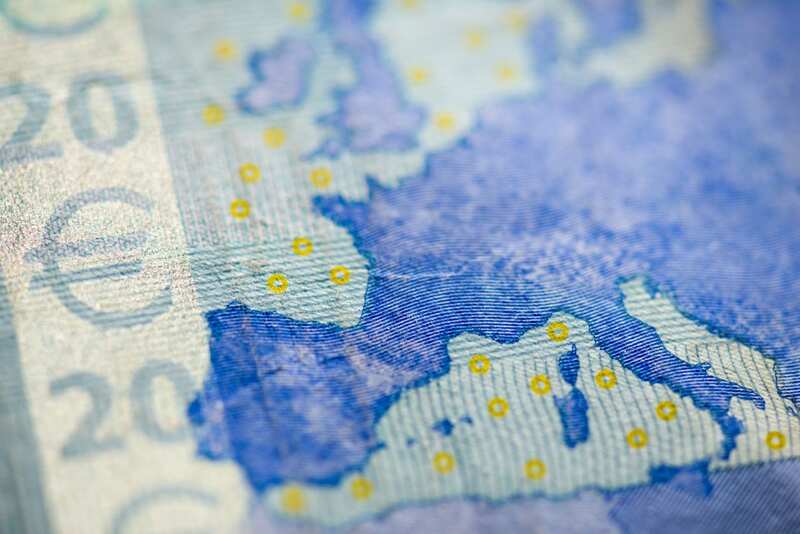 L/Cs reduce payment risk by providing a framework under which a bank makes (or guarantees) the payment to an exporter on behalf of an importer once delivery of goods is confirmed through the presentation of appropriate documents. 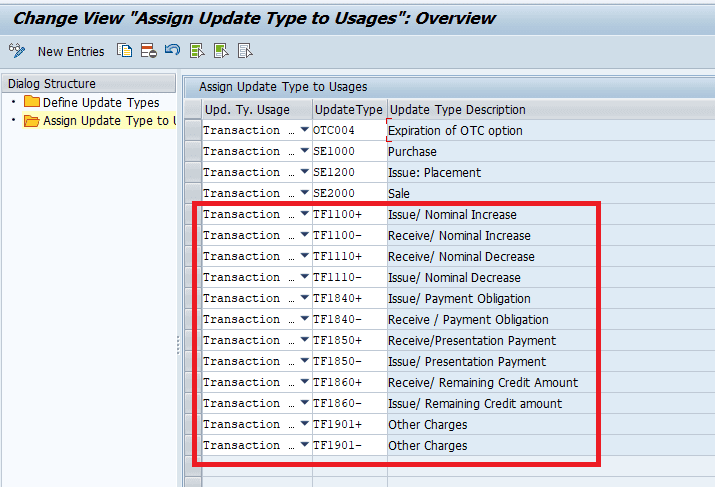 SAP has introduced new products to cover the trade finance in S/4HANA Treasury. The Trade Finance Management process generally covers the creation of ﬁnancial transactions and executes payments for fees and cash collateral for bank guarantee issuing. For further processing, the roll over and termination of transactions is possible. 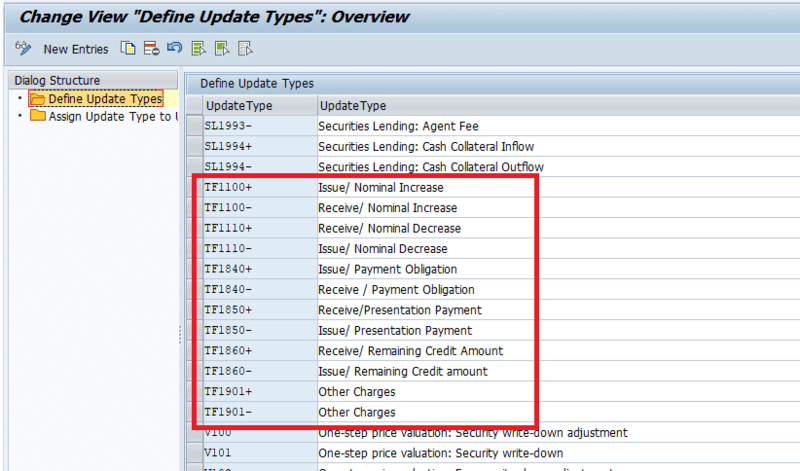 All of the ﬁnancial transactions can be monitored and reported in S/4HANA. Support the combined usage of the facility and cash collateral for the Applicant. 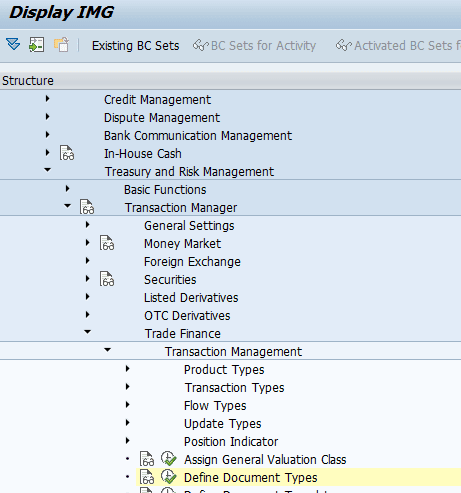 We will start by configuring the Trade finance instrument in S/4HANA . In this activity, you can maintain the product type as per your requirements. 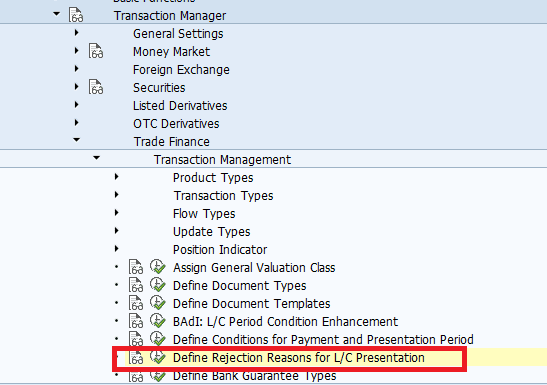 This will help you differentiate between your financial transactions and the transaction types used for each product type and their assignment. An underlying transaction is used in presentation to create an import bill advance for buyers or create export bills negotiation loans for sellers. 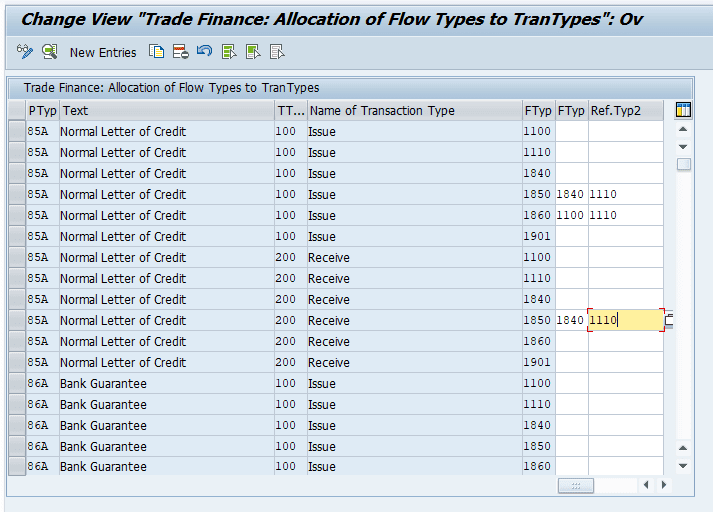 Flow category 85 could be assigned with 84 in reference type 1 and flow category 11 in reference type 2, which is assigned for the same product type and transaction type. 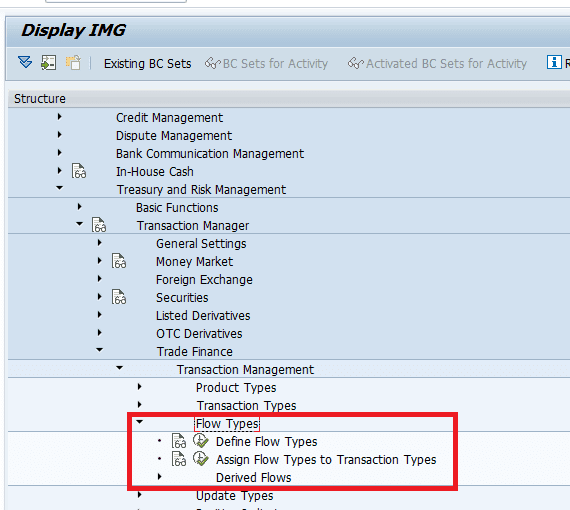 Flow category 86 could be assigned with 10 in reference type 1 and flow category 11 in reference type 2, which is assigned for the same product type and transaction type. In this Customizing activity, you define conditions for presentation and payment period. 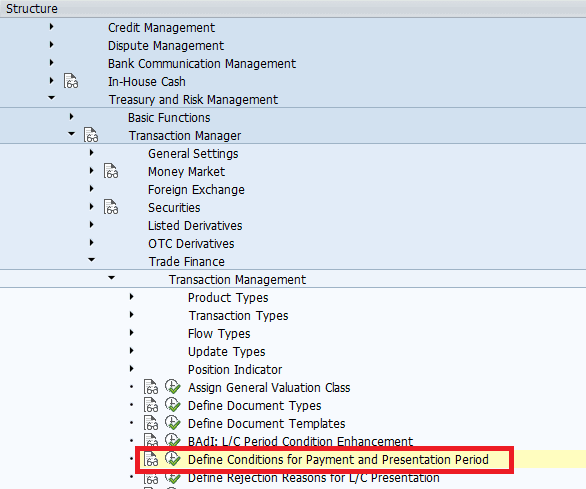 The system provides one default presentation period condition Shipment Date, and one default payment period condition Presentation Date. You can define other presentation and payment period conditions based on your needs. In this Customizing activity, you define rejection reasons for L/C presentations by assigning a reason code and a description that you can select later when you reject a presentation. 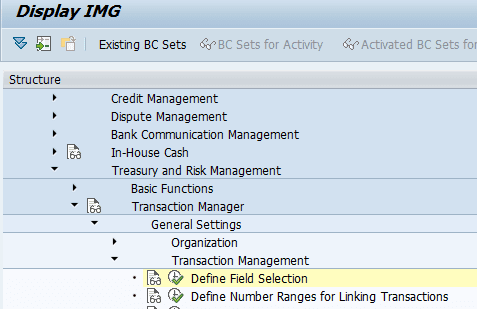 All fields that are visible in the entry screens are grouped according to business criteria. 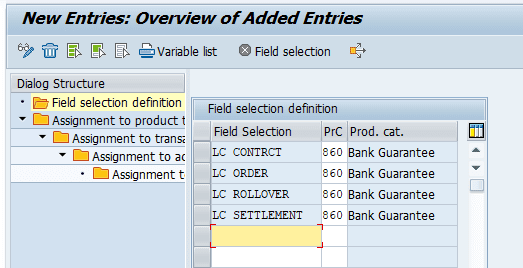 For each field group, you can define whether it should be shown or hidden and whether the entries should be required or optional. You can also configure the various tabs in the transaction entry screens (such as administration or correspondence); you can set the tabs to hidden, optional entry or display only. However, you cannot define tabs as mandatory. You cannot hide the Structure tab. Indicate Update Types as Relevant to Posting. In this IMG activity you specify (whether or not) the update type is relevant for posting. This can depend on the valuation area. 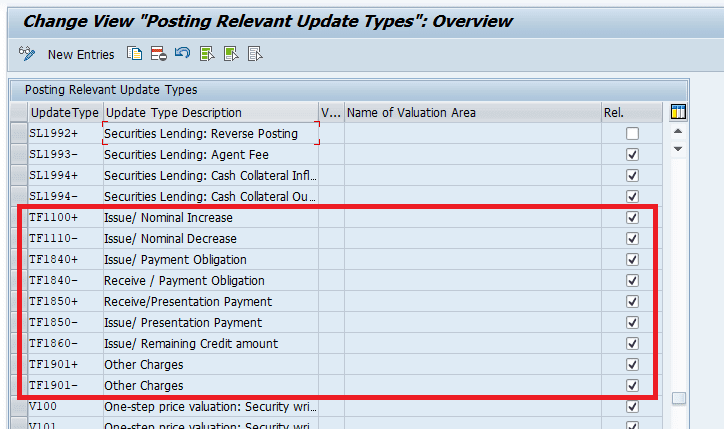 This means that you can post an update type in one valuation area and not in another. 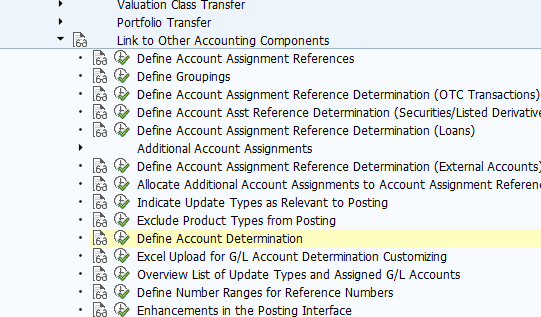 You define the account determination settings for the flows in the parallel valuation areas. 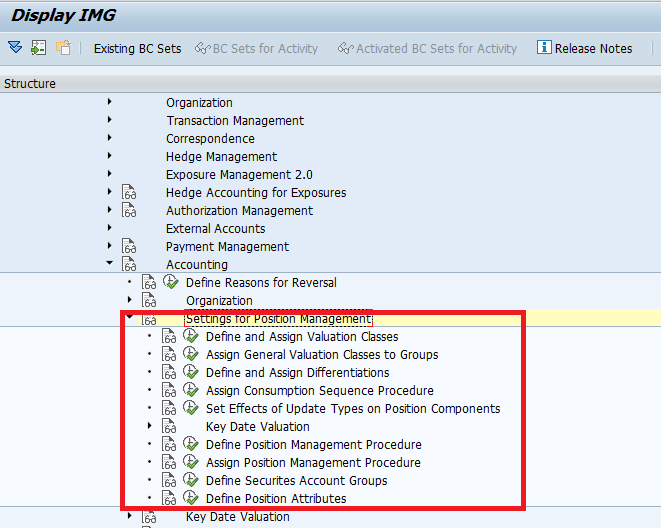 The account determination settings define the accounts to be used when the flows are posted to Financial Accounting. 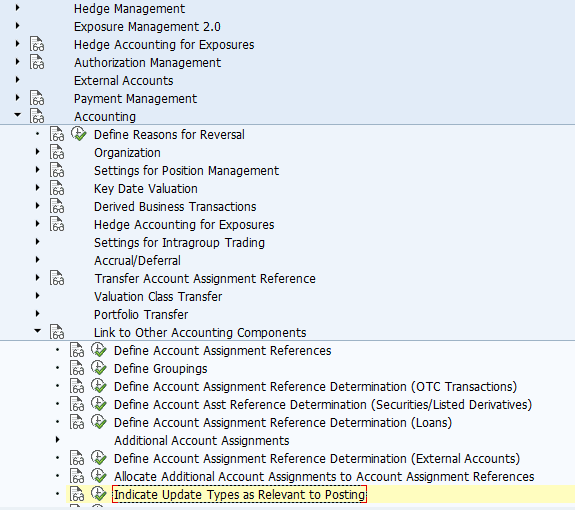 The system only posts flows in the parallel valuation areas if an update type is set as relevant for posting under Indicate Update Types as Relevant to Posting and if posting specifications have been defined for the corresponding update types in this IMG activity. In the following activities, you make basic organizational settings for the parallel valuation areas. 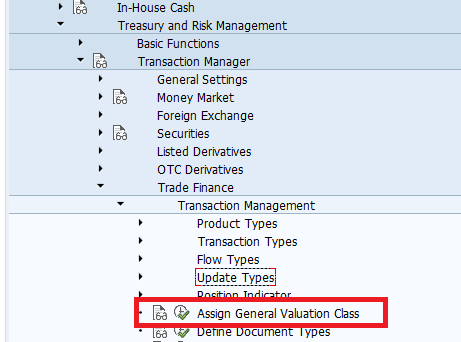 You first define the valuation areas and accounting codes, and then assign them to each other. 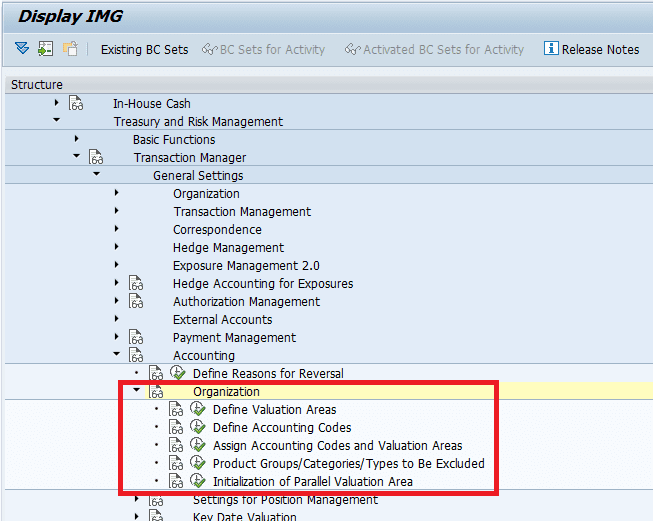 You also have the option of defining product categories not to be transferred to the parallel valuation areas. 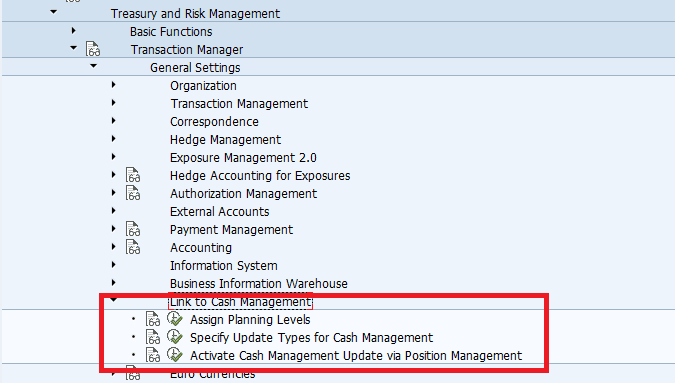 In this section, you can make all the system settings necessary for calculating risks and aggregating them according to different criteria. 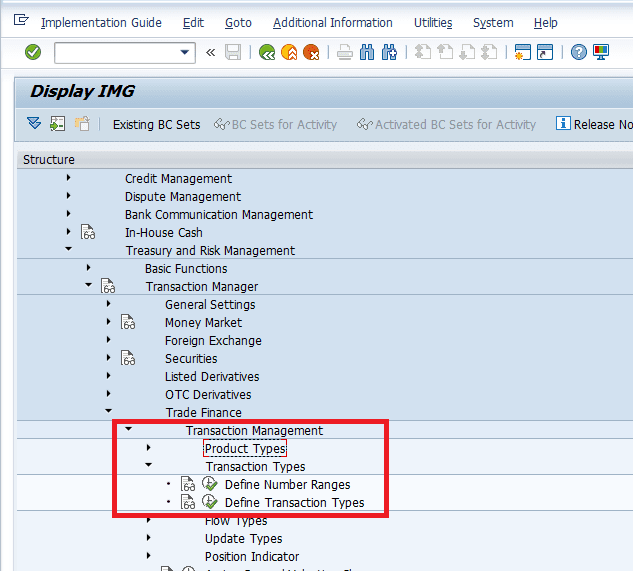 To be able to enter financial object data at the same time as you create master data, set the Component Active indicator. When you set this indicator, the system displays during online processing the relevant screens for entering transaction data for the component in question (such as Profitability Analysis and Default Risk Limitation). 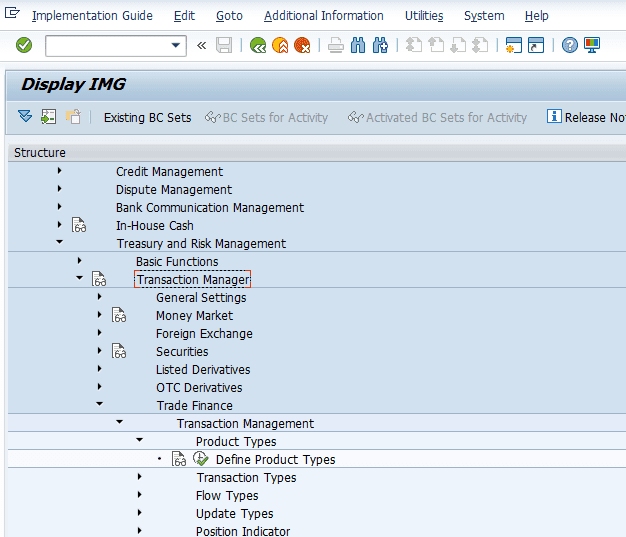 You can then enter the information required for the financial objects. Completely Active if you do not want the system to save the master data for the transaction when there are errors. Partially Active if you want the system to save the master data but not the financial object part that is incorrect. In this case, a warning message is triggered when the system saves the data. 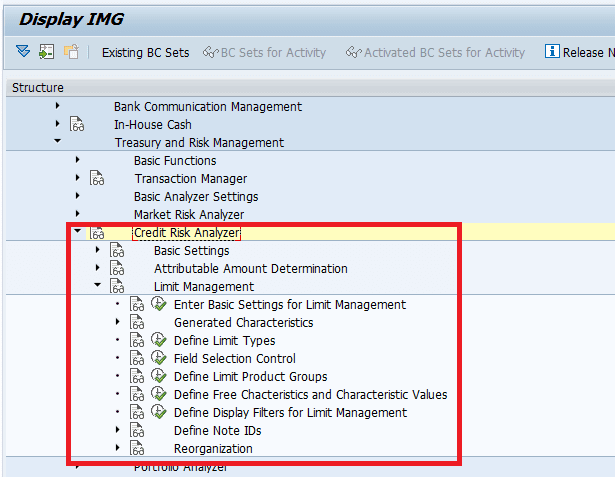 When you have made these settings on the company code level, you must then assign the product types for which these settings need to be active. 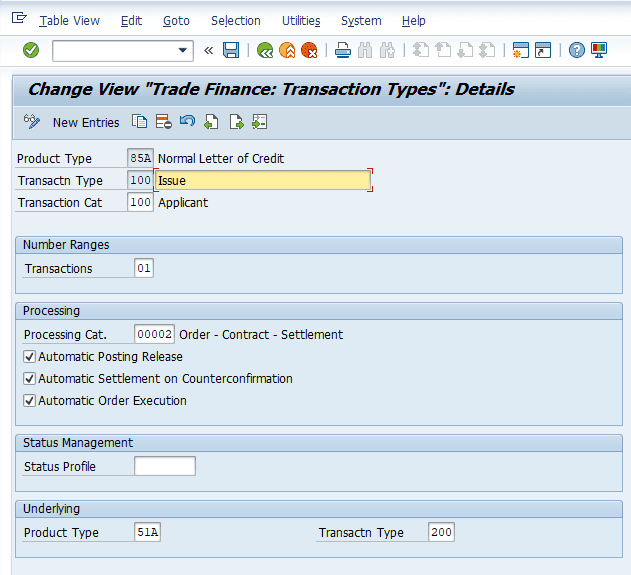 SAP S/4HANA Trade Finance Management helps you to better manage your Trade Finance instruments. This scope item supports common functionalities of Bank Guarantee, Letter of Credit and Stand by Letter of Credit. The system is able to capture the clear information classification with all details. The drawing and release facility can be automatically triggered based on the changes of the trade finance deal. 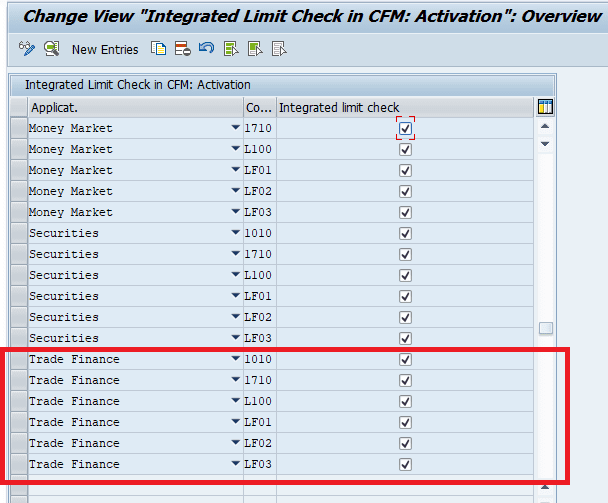 Credit risk analyzer can be activated based on the product types with customizable limit rules and limit types. The utilization and release of limit can be triggered automatically from the deals themselves. Preset status can cover the whole lifecycle of these financial instruments. 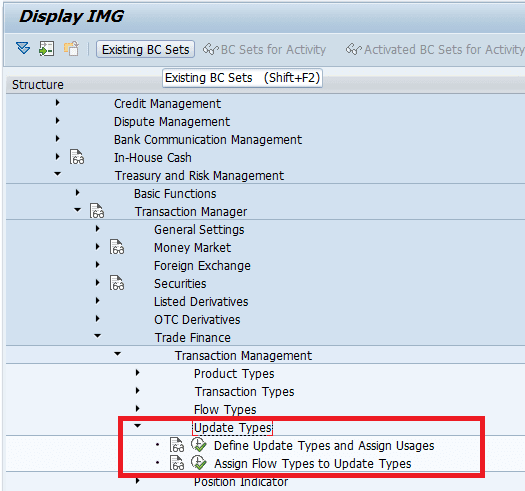 You can configure approval processes for status changes and posting releases. In addition to functions for creating and changing Bank Guarantees/LC, the system also supports functions for rollover, contract settlement, and contract termination. Cash collateral and Bank Guarantee fees are also covered.